Quite frequently in Web and Windows apps, I’ve found it necessary to display data values contained in an Enum type typically inside of a list or combobox type control. You can easily retrieve all the enum ‘values’ as strings using the static Enum.GetNames method. This gives you a list of all the enum values. If all you want to do is directly display the enum values as is then you’re done: You can directly bind those enum values to the drop down’s DataSource. If you want to display the enum values a little more nicely though you might want to fix the values up a little by converting them from Camel Case to more readable strings for display. The code above takes the original list of enum string values and creates a List of objects which hold the actual enum value and a string representation. which looks decidedly more user friendly than just the raw enum values. /// Tries to create a phrase string from CamelCase text. /// Will place spaces before capitalized letters. /// Takes a phrase and turns it into CamelCase text. This is a pretty rudimentary implementation of FromCamelCase and ToCamelCase but these come in handy in a number of situations and the enum conversion is a good example. which isn’t really any less code, but maybe a little easier to remember <s>… Notice that you can bind to the Key and Value fields of the KeyValuePair structure. Notice that I used a KeyValuePair object in the list rather than a dictionary. Dictionary would be easier to use but they are a pain to use in data binding and I can never remember what fields you have to bind to for text and value in the data source. where the App object is a static object that is used to store various configuration/constant information. which is easily reusable through an application. While it’s probably overkill to do this for short simple lists like this, I’m fond of caching repeated lookup lists like this on a static object reference where’s it’s easy to reuse. Remember that the value is the original Enum parsed string and so SelectedValue should retrieve the right value to bind back to whatever object/data item you are binding back to. The whole concept of using Enum values direct as ‘data’ is not something that is appropriate in all situations obviously. In more complex systems this sort of ‘lookup table’ used in the UI is probably better stowed in a database lookup table. And it really only makes sense if your application primarily defines fixed enum values rather than dynamic values that can be added to a table in the database. Using Enums like this is often useful to non-data items like option lists that are not typically part of the data model itself. However, in simple applications like this bug tracker there’s no separate lookup in the database and creating one just for the purpose of displaying the right value in the UI seems silly. Finally keep in mind that if localization is important enums are a really bad choice since you can’t localize them in anyway. As I said at the outset – this is functionality that you’ll likely use only occasionally for internal apps or for a quick input form that needs to be thrown up, but when you do need it’s a nice quick and dirty way to get data to work with into the page. Often times this will save some cross assembly refactorings that would arise as the display text needs to be changed. The calling code is dead simple. Thanks for the tip. FYI, the link to the DataBinder control got mangled. I had problems with this some time ago, but then I came to the realization that there was never an instance when I really needed to do this. Since I'm either working with a DB or a configuration file for any of my given projects, I stay away from this. The only reason I use enums now is for design time and I have been hard pressed to find instances that I need that kind of support. Before I use an enum, I try to convince myself that I shouldn't be using a full blown object. If I settle on an enum, then I look at why I shouldn't give myself and my customer the benefit of making it a list of items in a table. @Kim - thanks for the pointer on the DisplayText attribute. I had no idea there was such a thing. One problem with that is that you have to implement the DisplayText explicitly. Sometimes that may not be possible such as when you're dealing with external types that you don't control so the generic routine still has merit for the more generic use case. 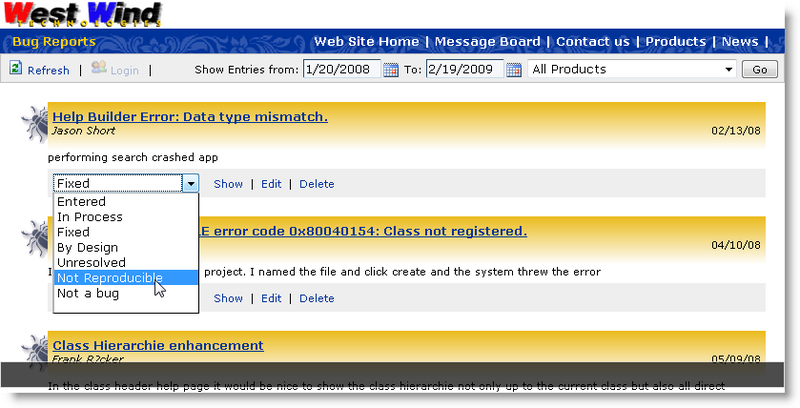 @JMP - Configuration settings is usually my most common use case for using Enums in the UI. I use my configuration classes that typically have a few enums associated with them. These values do not exist in a database (usually they are persisted in .config files) and so using the enum for display is a reasonable option IMHO. If a database is already used and lookup tables exist then it might make sense, but if you end up only duplicating the values that are already definied as Enums (because they DO have to match the enums in the data/configuration model) then what's the point of redefining them? Just one more thing that has to be kept in sync. Funny, I was just reviewing similar code as this popped into my reader. There's already a Framework attribute that can be used for this. ///        values in the specified Enum. ///        Get a dictionary containing Id/Description pairs for the supplied enum type. Nice article, though I'd probably prefer the solution using attributes. Speaking of the DataBinder: I use a patched up version of the DataBinder in some projects. Do you think about publishing an updated version ? If you use Enum-name+Enum-value as the resourcekey, you'll get even less code and the added benefits of allowing multi lingual applications. @Richard - I suppose you mean doing resource lookups for the list items right? Resources are good if you are localizing anyway, but a pain if you're not. Also getting resources is not really generic unless you use a solid convention to retrieve the resources consistently (a pattern as you mentioned). This is an good technique if you're not planning to localize your application, which in the case of an enterprise application, *always* comes sooner or later. As a best practice, I've come to not use reflected names in any way to display them to the user, mostly because updating a whole application that uses that kind of technique at multiple places is kind of a pain... Also, remember that if your assemblies will ever be obfuscated, you'll be facing the same issues, and you might have to selectively obfuscate. I'd suggest the same technique Richard did, using a mix of reflection and resources. @Mark - you caught me :-}. There are multiple places where the enum dropdown is used and when I took the screen shot I didn't realize that I accidentally picked one I hadn't converted yet - in the example the text indeed as manual values I had defined in the page. This has since been turned over into the same App.BugStatusListItems. I've blogged about this problem in the past, and have an entirely different solution to the problem of strongly-typing your domain values. It provides the flexibility of allowing for textual descriptions to your values, without the nasty string parsing. The attribute solution is also quite neat, but then requires reflection on the other side to extract the description from the values. A good bit of code, but have to agree with @Richard that it's probably better in the long run to localize them with a resource dll and be done with it. I agree that localization is initially a little more painful, but I just made a call LocalizedEnum( Enum value ) which does the trick and is in reality a lot less code. It also helps when the stakeholders want a different name for it. You can end up in a tail-wagging-the-dog situation where you construct your enums so that the print well in the UI, or renaming enums to suit changing business lingo. That might not be a bad thing really, but it does make for more pain if that enum is public. One small tip, you can use generics to parse strings back to the original Enum to get nicer code! /// Now you can use Generics to have cleaner code when enum parsing! A method I have used and found practical is to use resource files. If the Enumeration is the key in the resource file then you can easily look up the value in the Resource files-this also has the advantage that if your application goes global it is very easy to add translations into your project for other languages. Keep up the excellent blog Rick. @Alan - Great point to make about using Resources to allow UI customization. I was just reminded of this the other day as I was working on a localization project. Using resources is an easy way to customize the UI somewhat dynamically especially if you're using a data driven resource provider that doesn't require static resources that need to get compiled. This is a great article for enum and I enjoy reading it. Also I learned the stuff of how to paly around with Enum from your post. But I found one problem with your code. I'm not so sure whether you got the same error or not. When you call the GetEnumList(Enum enumeration) method to return list of key and value pairs of objects, you are passing the Type like this, Utils.GetEnumList(typeof(BugStatusTypes)) by using typeof(). It gives me runtime error : cannot convert from System.Type to System.Enum. I notice that you pass the Type and receive with specific Enum type. So i changed the method as follow and it works after that. Correct me if i'm wrong and i am still a newbie in c# and asp.net. http://tonesdotnetblog.wordpress.com/2010/02/14/string-enumerations-and-resource-files-in-c/ has an alternative solution involving passing the resource file and resource string name constant via attributes to enumerations, and these can then be read in as strings using extension methods.